Lumps Are No Match for the Blender Ball! Secure screw-on lid prevents leaks. StayOpen™ flip cap stays where you put it. Generous 28 fl oz capacity. Wide opening for easy addition of ingredients. Embossed ounce and ml markings. GripperBar™ sides for no-slip grip. Base sized to fit most cup holders. 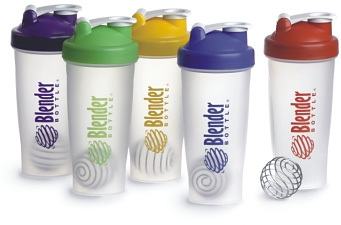 The Blender Bottle can't be beat for nutrition shakes and sport drinks, but it's also great for pancake mixes, scrambled eggs, gravies, salad dressings, and many other small kitchen tasks. Because of its versatility, everyone in your family (or at your office) will want to use it, too. Solve that problem by buying more than just one. Let everyone choose their favorite color, and keep yours to yourself! 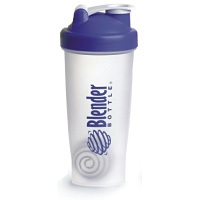 Better Fitness Products no longer sells Blender Bottles, but you can Buy them Here .